THG celebrated the national Museums at Night festival this October with a spooktacular Halloween party. 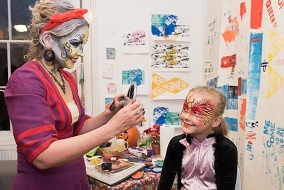 The event attracted a staggering 600 visitors who enjoyed a fun-packed evening including art activities as well as food and music which coordinated with the gallery’s community exhibition People’s Paolozzi. 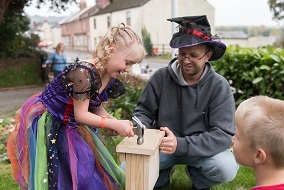 Families cut out and created silhouette shadow puppets and made their own bat boxes. 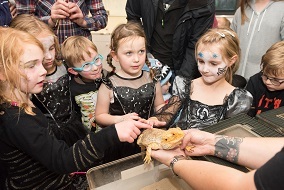 Kids loved getting up close to stroke geckos, lizards, a skunk and even a 10 foot python from Exeter Exotics. There was also some scary face painting and children enjoyed exploring the garden for spooky treats.